I live vicariously through my children. It’s not that being one of their parents that I haven’t spent my dues and taught them things. That was my job, and frankly I think I was damn good at it. But after it was all over and they were grown up that is not what amazed me, instead it was that they taught me so many things and have made my life richer and broader. It was several years ago that one of Justin’s friends, Jean F., would blog about “This American Life”, an public radio program. Although I tried at the time to download some of the episodes from the web it was only when I received an iPod as a present that I truly started listening. Now when I download any new podcasts to my iPod from iTunes, it is the first one I listen to. It’s my “virtual running buddies” when I exercise the morning. For 60 minutes I get lost in the stories and vignettes. I rarely donate to public radio, but I have donated to “This American Life”. So tonight I went to our local movie theater to see a limited video broadcast of “This American Life”. I enjoyed seeing the face behind the voice of Ira Glass. The stories were so typical yet it was unusual to be sitting (not running) in a audience of over 100 people (not by myself) watching a performance (not listening to my iPod). In any case thank you Jean and especially Justin for enriching me. I seem to look forward to relaxing on the weekend, but when it comes I seem to be busy. This weekend started with a dinner on Friday with Kathy’s yoga class teacher and students. They will be shooting a DVD video on Sunday. Then on Saturday I had a 25K Trail Race. Celeste D. and I signed up for it. I’ve never done a trail race. I even bought special trail running shoes. However on Saturday it was raining, and after an hour drive we arrived to find that it was canceled, so back home we drove. The best part was talking to Celeste, my running buddy, in the car over and back. Next Matthew and Beth phoned and said that they wanted to continue our look for a wedding rehearsal dinner spot in San Antonio (90 miles away). Before that Kathy needed to attend her Saturday yoga class in preparation for tomorrow. After she left for class I realized that it would be best to leave directly from her class. So Katie and I drove down with a change of clothes to find her. However we were five minutes late and by then she had already left and so we had to drive all the way back home. A total waste of time and gas – oh well. Next Kathy and I drove to San Antonio and met Matthew and Beth at a BBQ restaurant. We talked to the manager and although it’s too casual place the date was available. Before we left we sampled their Margaritas, and got a sample of food as take-out. [At each of these places I would hand them my credit card since that’s my job in this affair, that is, keep my mouth shut and pay the bills] Leaving their car at that place we then traveled together up to Boerne to another restaurant. After another talk with another manager, some sample desserts (yummy cheesecake), and another margaritas (very poor watery one), and another sample as take-out. We tried to find another restaurant in downtown, but it was too small. While sitting in the car talking and munching samples Matthew accidentally spilled his soda by his feet in our new car. A small brown lake formed and we spent 20 minutes mopping it up with tissues and napkins. Did I tell you that we bought a new car, and that it was in the back seat of this pristine vehicle that this happened. Oh well, it’s now a “real” car, and with the smell of BBQ replacing the new car smell too. [The next day I took a pail of water and a brush and cleaned it up.] It was getting late so we stopped by a Rudy’s BBQ, but it was not very good for a rehearsal dinner spot. Next door was another restaurant. We talked to the manager, and sampled a margaritas, but I had to cut it short because we had to leave. See we had a Broadway play, Avenue Q to attend in Austin at 8 PM and needed to get back for it. Luckily we arrived in time, but by then we were both exhausted. Me from waking at 5 AM for the trail race, and Kathy from all the travel and talk about rehearsal dining. We nodded-off during the musical partly because we were tired and partly because it was just average and didn’t catch our interest. Arriving home at 11 PM we crashed. On Sunday I did my long run since I hadn’t run on Saturday. The route started downtown. After driving 20 minutes I got out and put my extra running stuff in the trunk. As I opened it I realized that the night before we had put Kathy’s yoga stuff in it, and she needed it on Sunday morning because they were shooting the video. Well I rushed back home (another 20 minutes north) to a stressed out Kathy who promptly left for her appointment with her yoga stuff. Back I went downtown, and got my run in. It’s called the Run from Hell because there are many hills in it. After completing it, driving home, and getting a shower, Katie and I went to see the “17 Again” movie. It was a light comedy. Next Katie and I went shopping while Kathy was still gone to her yoga “shoot”. I bought Kathy flowers and a card to say I was sorry for stressing her out with my absconding with her yoga stuff. We arrived back home, unpacked the groceries, and I made a Mary-Tyler-Moore recipe from the Hagan cookbook – a yummy golash. While it was cooking Kathy arrived home. We ate together watching TV which is our regular habit these days. Afterwards I’m now up at the computer typing this, and Kathy and Katie are downstairs watching a TV program. And another weekend ends with me more tired than at the beginning. Welcome to my life. Tonight Kathy and I went to the book tour of “It Sucked and Then I Cried: How I Had a Baby, a Breakdown, and a Much Needed Margarita” by Heather Armstrong, AKA dooce.com. Kathy was kind enough to go and share this with me even though she doesn’t follow this blog. It was held in downtown Austin at Book People. I heard about the tour from LSL’s blog in Portland, and found out she was going to be in Austin today. I and about 5 other guys were lost in a sea of thirty-something women. It was apparent that I wasn’t her normal demographics. However, I’ve been reading dooce probably since 2002 when my son was in graduate school at UNC. At that time I would follow the links from his page to his friend’s and acquaintance’s pages to keep up with what he was doing and who he was hanging out with. One of them, a person who designed book covers, linked to dooce.com. It took me a while after reading it a few times to figure out that Heather was not a UNC student. Her writing was witty, sarcastic and biting. She made me laugh. That was then and this is now. Tonight she was very entertaining. She made both Kathy and I laugh by reading from her book and blog. Afterwards she graciously signed my book. As I stopped at the signing table I said “In your special way you keep my son and his girlfriend employed at Federated Media.” When she heard Federated Media she said “They’re my people”. Note: Federated Media provides the advertising that is on her site. We told her that he’s a techie and she’s the remnants manager. I’ve now got a new book to read. Update: Oh, and Jon was there too. Quite a surprise. Sitting in the aisle next to me taking pictures and watching his beautiful wife charm the SRO crowd. 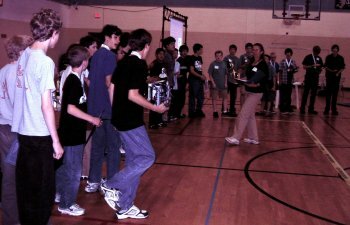 I was again the scorer for the Austin Robofest event yesterday. Prior to today I’ve attended organizing meetings and have written a placement randomizer and scoring spreadsheet. In other words, my evenings have been busy this past week. The event was held at the Austin Recreational Center in downtown Austin. I arrived at 11 AM and left at 7 PM. During that time I helped set up, then scored each game and match, and cleaned up afterwards. It’s always fun to watch the young people’s creativity during this competition. Each robot is uniquely crafted by them, and the autonomous programming shows such variety and insight into different ways of solving the same problem. Although the day starts out stressful with the unknown issues that have to be addressed, then at the end of the day there is such satisfaction in knowing that you helped someone else and had fun doing it. I really appreciate the excellent organization and the camaraderie of the judges and volunteers. Both of these keep me returning as a volunteer. Oh, did I mention that the pizza dinner afterwards was great too. You are currently browsing the Watt's Up blog archives for April, 2009.